Nice to see Alicia Silverstone back on the red carpet! Alicia was at the Cinema Society screening of Butter in New York on September 27. She went for a slight flapper-style look in a gold silk layered dress with black bow waist which co-ordianted to her heels. For a similar style to a Alicia's look try Costume National's C'n'C $185.00 Beige Layered Dress. Hayden Panettiere is the cover star for the October issue of Women's Health magazine. 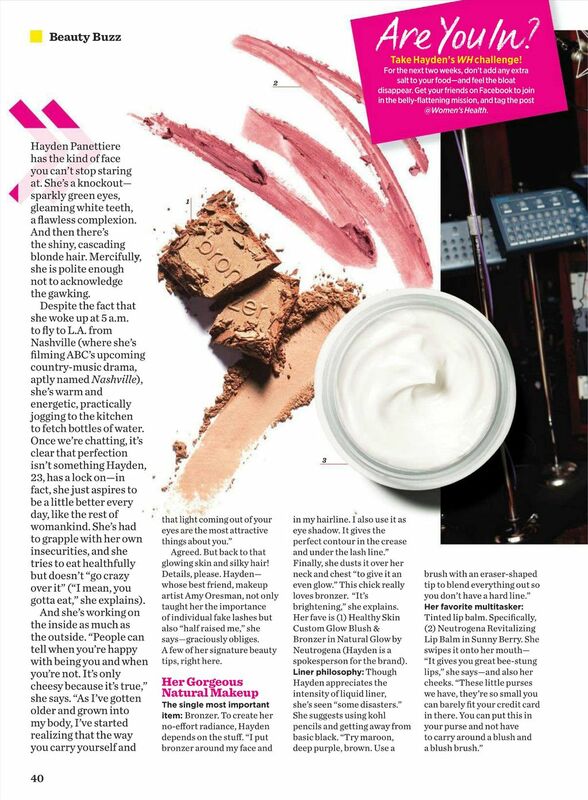 Inside the Nashville star talks about her hair and beauty secrets from reallife and on the show. 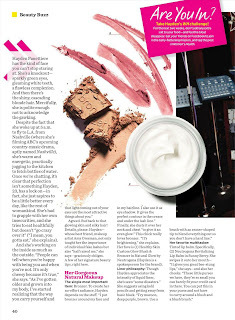 Among Hayden's tips are to hide make-up remover wipes all over her house so even if she feels too tired to take off her make-up she can also find some remover. She hides her's behind her pillows, in her purse, and in her nightstand. Back in from a trip to the UK, Victoria Justice was at the 10th Annual Teen Vogue Young Hollywood event on September 27. Victoria brightened her black crop and black trews look with a pink velour blazer and sparkling jewels. 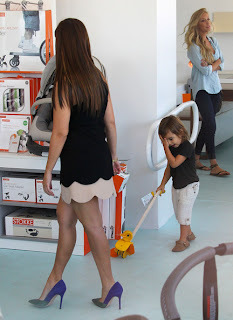 Kourtney Kardashian was papped shopping with son Mason in Miami a few days back (September 28). Kourt wore a loose black dress with fab point-toe heels from designer Jean-Michel Cazabat, and Prada's curly Baroque sunglasses. Prada's Black Baroque sunglasses (above) cost $170.00 at amazon.com; black curly frame Baroque look is available costing around $6.00 at amazon also. Jessica Alba went cutesy in Hello Kitty as she headed for some spa time in Hollywood on September 28. Jessica wore the yellow HK top with simple black leggings and jacket, plus colorful sneakers. 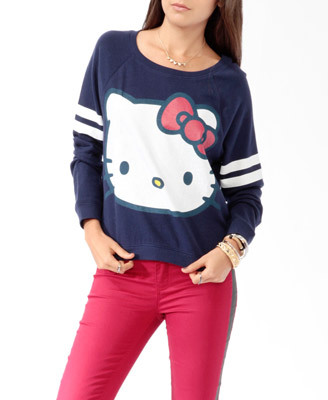 Get a similar Hello Kitty look with the F21 Pullover Top which costs $18.80. Most stars co-ordinate their clutch and shoes but for Kelly Osbourne it was gown and hair at the 64th Annual Primetime Emmy Awards. Kelly matched her lilac ponytail with her Zac Posen dress and despite all that glam, nothing quite matched up to her most expensive touch: her black diamond manicure. Kelly wore a nail polish (costing $250,000 a bottle!) containing 267-carats of black diamonds made by jewellers Azature. Lucky Ms. O didn't have to pay though, the manicure was courtesy of Azature. The only other person to have worn it is Jennifer Lopez. 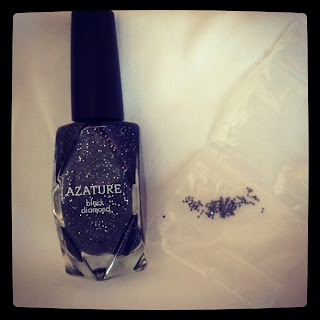 A similar look for less is China Glaze's Black Diamond Nail Polish. Azature also make a cheaper version, not real diamond of course, which is $25.00. At the iHeart Radio Event last week, Miley Cyrus showed off her Pilates-honed abs in a crop-top and metallic silver skirt. She paired the skirt with a gold Moschino belt for a metallic combo (the skirt is possibly Moschino too, $348 at yoox), and completed the look with leopard print platform shoes. Get a similar leopard print look with the Alba Leopard Print Platform Heels which are $34.99. Some candids of Olivia Palermo papped in Brooklyn before she headed out to Paris for Fashion Week. Out early she was in a mulberry-colored sweater with a grey blazer and skinny blue jeans. Joined by Johannes Huebl later she ditched the jeans and blazer switching to a leathery Reiss skirt instead. Each look was paired with point-toe heels. The red, black, and white pair worn with the skirt are Manolo Blahnik. Skipping the Emmys, Dianna Agron attended the opening of Luc Besson's Cite du Cinema in Paris last weekend (September 23). Dianna was sombre in a black Dior Haute Couture gown but added a quirky colorful touch with her Dior flower ring. 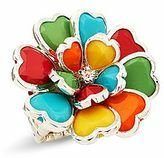 Get a similar floral ring look for less with the JC Penney Flower Stretch Ring which comes in various shades and only costs $12.00. The Emmy Awards red carpet was filled with blue and yellow gowns so Ginnifer Goodwin was a definite stand-out in her orange Monique Lhuillier gown. Ginny teamed the gown with well-matched sheer-and-orange Christian Louboutin point-toe heels; and jewels from Rona Pfeiffer and Graziela. Nominee Nicole Kidman arrived at the 64th Annual Primetime Emmy Awards on September 23 in a beautiful white and blue Antonio Berardi column dress that set itself apart with stunning blue wing-design beading and sequins. Nicole told People magazine she picked it because: "There were two dresses, but one was too hot,". She completed the look with frosty blue eyeshadow to match her sequins; Christian Louboutin heels, simple hair, and glam Fred Leighton drop earrings. You can't really see them in these pics, but Nicole's sandals are Christian Louboutin's Black and Blue Satin Bow Sandals which cost $945 at barneys.com. Some of the main award winners seemed to have something in common this Emmy Awards, something bright. Winner of Outstanding Lead Actress in a Miniseries, Julianne Moore wore a Dior Haute Couture wide skirt gown. Another Best Actress, Claire Danes, said she picked her Lanvin creation as it needed no alteration to fit her blossoming baby bump. Barbra Bui heels and gold Lorraine Schwartz jewels completed her look. Outstanding Supporting Actress in a Comedy Series Julie Bowen also went strapless in a citrus-y Monique Lhuillier gown with Jimmy Choo heels and Bochic jewelry. January Jones went a little gothic this Emmy Awards, held last night (September 23). The Mad Men star stepped out in a black Zac Posen gown with Cartier jewels, Christian Louboutin platform peep-toes, and her new darker hair hue.